Practicing and Motivational Tip: Make it Emotional! Home / Music Theory for the Bass Player / Practicing and Motivational Tip: Make it Emotional! Very often we can vividly recall times/moments of our lives that were very dramatic; or loaded with emotional (good or bad) responses. This means to me that we were very deeply involved with a given situation. We were living it with great intensity. And this imprints the memory of everything that happened very strongly into our minds. Involve all your senses, track what you are playing/learning both with your physical senses and mentally (following along in your mind, visualize). And, most important, bring the strongest purveyor of energy into the whole experience: bring in emotions. ▪ If the music has an overt emotional content or context, feel the emotion. ▪ If the music itself doesn’t seem to trigger it – maybe because you are too busy with executing the notes – conjure it up. Imagine what the feeling feels like, remember a similar situation or a scene from a movie – anything that helps you get into the emotion. And then let this energy become part of your experience. 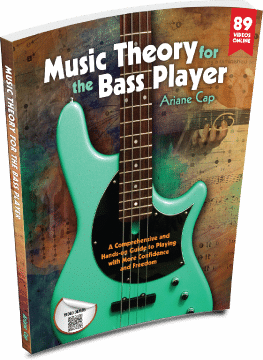 Source: Ariane Cap’s Course, Music Theory for he Bass Player – The Course – a 20-week course on theory, technique, bass line creation and more contains a section containing practice tips. This is one of 20 practicing tips from the course. Practicing tips are located in the OUTRO Tab of each course unit. This is a crucial concept. If you can communicate the true raw emotion of your performance, or practice, nobody is going to scrutinize a note choice because they will be along for the ride. Like hearing two people argue in an unfamiliar language. Our goal as students is to marry the emotion with the execution. Great analogy – “hearing people argue in a different language”…. very fitting. Marrying emotion with execution – yes. Our goal as musicians and a never ending journey; as we improve our technique and understanding of music, ever new depth open up. Thanks for this post. I get so caught up in the technical parts that I forget about the essence of music – the emotional part. The few times I’ve filmed myself playing I look like a robot. Your post hit the spot. Hi Emily, thank you for reading and your comment. Emotions help us learn AND enjoy, for sure!